It's classic Buckley, timely, funny, sarcastic, and superficial. 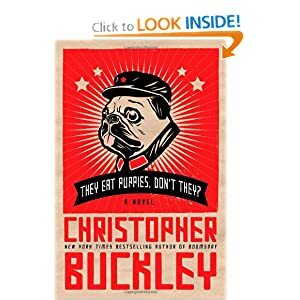 It's the last one that has caused me to go off my feed when it comes to Buckley novels. If you haven't read any Buckley, you should definitely give him a shot. At least two or three. Is this the William F. Buckley Jr.'s son Buckley? Five are listed on wikipedia. I eliminated the football player and Augustine. Here's a tip for getting that information. Having arrived at the list of Buckleys in wikipedia, the next step is to click on the one that says (novelist) after the name and read the first paragraph.